View a Celebration of Dr. Flockhart here. David A. Flockhart, M.D., Ph.D., an internationally renowned researcher and physician who transformed care for patients by personalizing treatments and making medications safer and more effective, died on Thanksgiving Day (November 26) in his home in Indianapolis surrounded by his family. He was 63. Dr. Flockhart was diagnosed a little more than a year ago with glioblastoma multiforme, an advanced type of brain cancer. Ever the teacher, he shared his personal experience with the disease through radio interviews, public forums and other avenues, addressing important issues such as access to care and inefficiencies in the health care system that place an undue burden on patients. Dr. Flockhart was a pioneer and leader in the field of pharmacogenetics, which involves understanding how an individual’s genes affect his or her response to drugs. Since 2010, he served as the founding director of the Indiana Institute for Personalized Medicine at Indiana University, one of the nation’s first such institutes focused on tailoring treatments for each patient. His research touched nearly every aspect of medicine, from cancer to cardiology, and obstetrics to infectious disease. He is perhaps best known for his work with the breast cancer drug tamoxifen, taken by hundreds of thousands of women around the world to reduce the risk of cancer recurrence. Dr. Flockhart’s laboratory made a critical discovery about an enzyme known as CYP2D6. CYP2D6 plays a role in converting tamoxifen into a metabolite called endoxifen, which is involved in fending off breast cancer’s return. Dr. Flockhart’s team found that variants in the CYP2D6 gene, naturally observed in some women, disrupt that process and could reduce the effectiveness of the drug. What’s more, he found that certain antidepressants block the CYP2D6 pathway, inadvertently changing the way tamoxifen is metabolized and also impacting its effectiveness. Dr. Flockhart had an insatiable thirst for knowledge, and his mind whirled with new ideas and projects to explore. Colleagues describe how he’d get a glint in his eye, and would be off and running. He was a consummate clinician-scientist with a dizzying sense of energy and urgency and who was singularly focused on helping patients. In fact, it was his passion for patient care that drew him away from his initial career path as a pure laboratory scientist. A native of Scotland, he earned his Ph.D. from the Welsh National School of Medicine in the United Kingdom, and later was hired as an assistant professor of physiology at the Vanderbilt University School of Medicine. But that wasn’t enough for him. Dr. Flockhart enrolled at the University Of Miami School Of Medicine, graduating in 1987. He continued his training with a residency at Georgetown. It was there – thanks to a patient – that he was first drawn to clinical pharmacology and personalized medicine. He went on to complete a fellowship in clinical pharmacology at Georgetown, joined the faculty and, ultimately, led the division before being recruited to Indiana University in 2001 by Dr. D. Craig Brater, then chair of the Department of Medicine. At IU, he served as the longtime director of the medical school’s division of clinical pharmacology and as the Harry and Edith Gladstein Professor of Cancer Epidemiology and Genetics. Over the course of his career, he became one of the world’s foremost authorities on drug interactions and reactions. Patients from around the nation sought his opinion when other doctors insisted they were simply imagining or inventing sometimes painful and debilitating side effects. He published more than 250 articles, reviews, and book chapters, and was a member of many prestigious professional organizations. 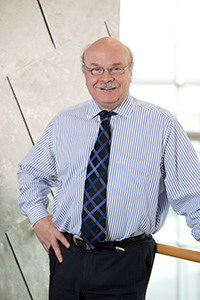 He received numerous awards, including the Leon I. Golberg Memorial Lecture Series Award from the University of Chicago, the Rawls-Palmer Award for Progress in Medicine from the American Society for Clinical Pharmacology and Therapeutics, and the Nathaniel T. Kwit Memorial Distinguished Service Award from the American College of Clinical Pharmacology. He passed on his enthusiasm and compassion to dozens of rising physicians and researchers in clinical pharmacology and other specialties who saw him as a mentor and a friend. Dr. Flockhart’s drive to improve others’ lives extended far beyond the sedate confines of academia. As a resident at Georgetown, he opened a clinic that catered to the city’s refugee population, recognizing that many of those patients were denied access to quality care. He also cared for a large number of people with HIV and AIDS, who at that time in the late 1980s and early 1990s were blatantly discriminated against and shunned by many caregivers. He stayed in touch with many of those patients even after moving to Indiana. While at Vanderbilt, he was instrumental in forming the local chapter of Amnesty International. He organized public forums, led letter-writing campaigns, attended vigils, and was a frequent public speaker in support of human rights. His work with Amnesty extended for many years and included service on national boards and attendance at international conferences. Dr. Flockhart was born July 22, 1952, in Edinburgh, Scotland, the eldest of five children to Pamela Ellison Flockhart (née Macartney) and the Rev. D. Ross Flockhart. Though his parents originally hailed from Australia, they moved to Scotland for his father to study divinity and quickly grew to love the country and its people. Dr. Flockhart moved to the United States in the 1970s, and became a U.S. citizen in the weeks before he died, but never lost great pride in his Scottish heritage. He frequently took his three children to visit the family home at Longwood, Humbie, East Lothian, and pictures of the tranquil Isle of Iona – another place of great meaning to him and his family – graced his apartment in Indianapolis. As a child, Dr. Flockhart was tutored by a governess, and later attended junior school in Aberdeen. He attended George Watson’s College in Edinburgh for the majority of his secondary schooling before earning his undergraduate degree in biochemistry at Bristol University in England. He had a lifelong love of music and played the guitar from a very early age. He appreciated all types of music, from classical artists to James Taylor. He was a world traveler and took up scuba diving as an adult, and fondly described the Lanai Cathedrals in Hawaii as his favorite dive site. Above all, Dr. Flockhart was a loving father. He is survived by his three children, Andrew Flockhart and his wife, Rachel, of New York, Julia Seeley of Florida, and Peter Flockhart of Boston. He is also survived by two brothers, Andrew Flockhart and his wife, Judy Lister, of Poole, Dorset, England, and Patrick Flockhart and his wife, Linda, of Humbie, Scotland and London, England; a sister, Carola Akindele-Obe and her husband, Oye, of Perth, Australia; and a niece Zoe and nephew Hugo. He was predeceased by his parents and a sister, Fiona, who died tragically in 1970. There will be a private family farewell and cremation on December 2. A wider Celebration of Life and visitation for all friends and colleagues will be held at 3 p.m. Friday, December 4 in the Hine Hall auditorium on the IUPUI campus in Indianapolis. A memorial service will also take place in Humbie, Scotland on a date to be determined. Memorial contributions may be made to either the IU School of Medicine Division of Clinical Pharmacology or Amnesty International. Please make checks payable to “IU Foundation” and mail to IU Foundation, P.O. Box 7072, Indianapolis, IN 46207-7072. Please indicate “In memory of David Flockhart” on your gift or to Amnesty International at amnestyusa.org. By any measure, David Flockhart was a remarkable success, and a remarkable human being.